No, your eyes aren’t playing tricks on you. When I saw this “wedding cake” as I was searching for something fun and whimsical I knew it just had to be shared. We’ve seen a lot of unconventional wedding cakes around here – OREO cookie cakes, chocolate chip cookie cakes, doughnut cakes, and even cakes made out of cheese. 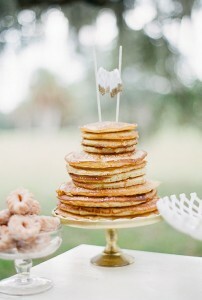 But a three-tier wedding cake made out of pancakes is a first. And I have to be honest – I love it! Imagine how much fun this cake would be at your morning or brunch time wedding reception. You can pair it was a dessert table filled with doughnuts, croissants, and other yummy breakfast sweets. It’s just such a fun cake idea and would be perfect for a smaller, casual reception. Would you ever have a non-cake wedding cake? You can find this pancake wedding cake here.